Arrival of participants 18:30 p.m. Follow by a refreshment based on wild herbs and products from the valley. The gong bath uses the vibrations of sound and frequency emitted by the gongs to connect and flow emotion and thought in balance. Gong is a cylindrical-shaped percussion instrument that originated in Southeast Asia, its sounds can help to reduce anxiety, stress and bring out emotions. In the gong bath the participants are immersed in sound waves that wash away the tension providing an energetic cleansing through the vibrations of the gong. Corniolo Art Platform starts the 2018 season with a special participation fee, in collaboration with the holistic musician and trainer Alessandro Curradi of the Om Resonance training school. Gong Master Advanced Trainer and Holistic Trainer Operator registered at the S.I.A.F. 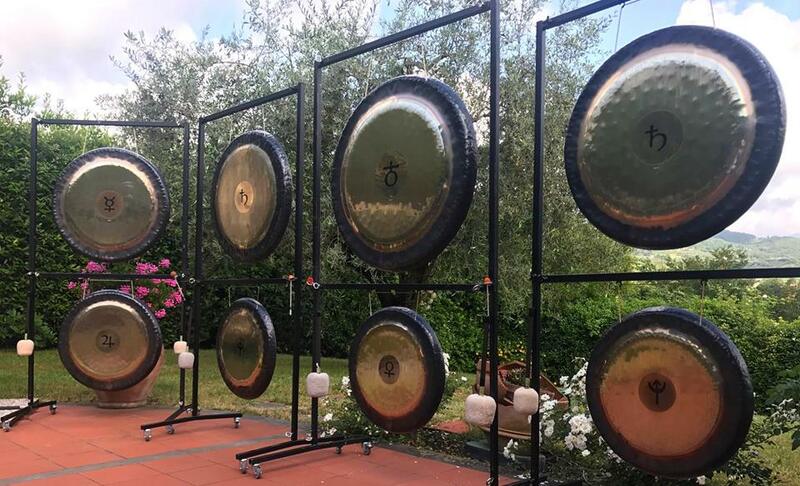 Musician and expert in sound-vibrational techniques, founder, together with Lorenzo Panchetti, of Florence Gongs and of the PTP “Personal Transformation Project”, he leads training courses on Planetary Gong, subtle anatomy, breathing techniques, crystals, communication, ethical code. It also performs individual treatments and group sessions aimed at energy rebalancing through tools such as Planetary Gongs, Tibetan bells, Reiki, Bach flowers, essential oils, stones and crystals, breath, meditation and other techniques of vibrational nature.